At Holy Cross in P.7 we recognise, discuss and understand the nature of bullying and the harm that can result. At Holy Cross in P.7 we become aware of the potential danger of relationships with strangers or acquaintances, including good and bad touches. how bicycles are best maintained and ridden. Primary 7 have now completed their Cycling Proficiency. Well done and remember to keep safe on the road! They are pictured along with their trainers Mrs Denise Sloan and Mrs Sharon Grant. The Cycling Proficiency Scheme (CPS) has commenced for our primary 7 children. It teaches children who can already ride a bicycle, how to do so more safely. It covers what to wear, bicycle maintenance and the rules of the road. 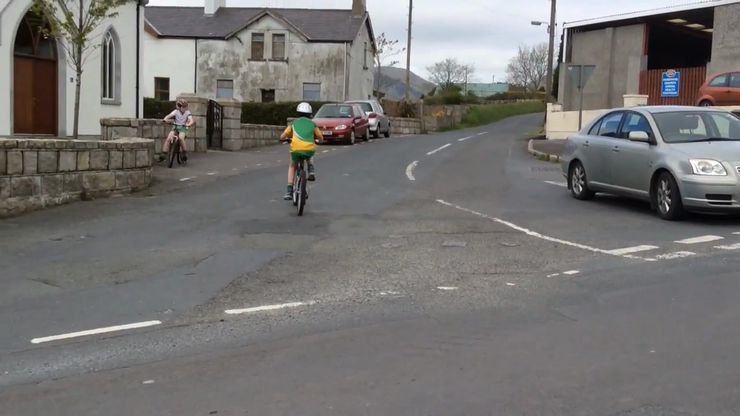 It also allows children to practice cycling manoeuvres in a safe environment. Manoeuvres include starting off, slowing down, stopping and parking, turning right and left, overtaking parked cars, passing side roads and carrying out emergency stops safely. As well as the practical aspects, pupils must pass a theory test on relevant sections of the Highway Code. Primary seven pupils in this video are completing their cycling proficiency training. At Holy Cross in P.7 we develop a pro-active and responsible approach to safety. At Holy Cross in P.7 we know where, when and how to seek help. At Holy Cross in P.7 we are aware of basic emergency procedures and first aid.